(Dan Trimmer, 1996). Tetraploid (Tetra Siloam Gum Drop X Tetra Wings of Chance) Garden visitors have been asking for Jack since its maiden bloom. 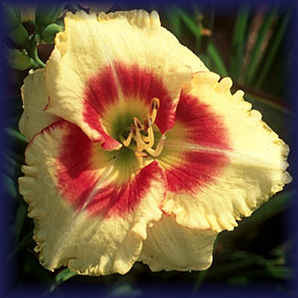 I consider Monterrey Jack to be an extremely important color break in the tetraploid breeding of daylilies. We have so many wonderful purple and plum eyes and edges, but so few red eyes and edges. I know of no other large tet. flower with big, well defined, red eyes on clear yellow petals. Usually, color breaks come coupled with less than desired forms in the hybridizing world of daylilies. This is not at all the case with “Jack.” Early in the morning he is flat opened, and throughout the day remains unchanged in color and crispness. First blooms exceed 6” with the last being over 5”. Flowers are round and very circular with large ruffles that are edged with a wire of red surrounding about 1/2 of the petal. Sepals are blunt and rounded. Jack is the parent of red eyed, red picoteed, yellow and cream flowers of large size and beautiful form. When I moved to Florida from Long Island I was afraid that due to Jack’s northern bloodlines he would not perform, so half came down during last summer, and the 2nd half after much northern chilling. Both grew well, but more chilling increased bloom size. Jack is early, dormant, about 24” tall, well branched with the usual branching consisting of two or three laterals and a terminal Y. Jack is a very good grower and increaser with dark green low arched foliage. If you want either a beautiful eye catching garden subject, or a hybridizing entry into red eyes and red edges I highly recommend MONTERREY JACK. Jack is probably my most important introduction to date. Many of his offspring are almost white with red eyes.